Hindscarth is one of the less familiar fells in the Buttermere scene, where it rather disappears in the long ridge of high ground to the north-east of the valley, but it presents a rather more impressive face to the Newlands Valley, with the long finger of Scope End running down into the valley. The northern side of Gatesgarth Dale (the valley leading from Buttermere to Honister Pass) is dominated by steep slopes that run up to a long ridge that runs from High Snockrigg in the west, past Robinson and Hindscarth and ending at Dale Head. Robinson and Hindscarth are similar in form - in both cases they form a high ridge that runs north from the Gatesgarth Dale ridge into the Newlands Valley, with the highest point on both fells some way to the north. Both fells have long northern ridges that drop down into the valley - High Snab Bank for Robinson and the rather more craggy Scope End for Hindscarth. The Scope End ridge is the most dramatic and most satisfying way to the top of Hindscarth, bringing the walker to the summit plateau quite close to the summit. The lower reaches of this ridge are rather craggy, with some awkward scrambles, and further up the path sometimes runs rather close to the eastern drop (these stretches can be avoided by taking to the top of the ridge). There is only one path across the summit of Hindscarth - the path that comes up from Scope End and runs south to the Buttermere end of the fell. Another path runs along the southern end of the fell - to the west it runs across Littledale Edge to Robinson while to the east it crosses Hindscarth Edge to reach Dale Head. The summit can thus be reached from either of those fells. Littledale Edge is fairly gentle and can be climbed from either side, although there are no paths and the Buttermere side has an annoying fence with no stiles. Our ascent of Dale Head from the Newslands Valley passes over Hindscarth. The highest point of Hindscarth doesn't really stand out on the large plateau. There is a cairn, but the most impressive feature in the area, a much older shelter cairn, sits a short distance from the top. This is also a better viewpoint than the main summit, sitting nearer to the edge. Gatesgarthdale Becks flows from east to west across the southern flank of the fell. A series of nameless becks run down the southern slopes into Gatesgarthdale Beck. Near Tongue Gill and Far Tongue Gill both flow north-east from their points of origin below the western end of Hindscarth Edge, forming the boundary between Hindscarth and Dale Head. Both flow into Newlands Beck when then forms the eastern boundary of the fell. 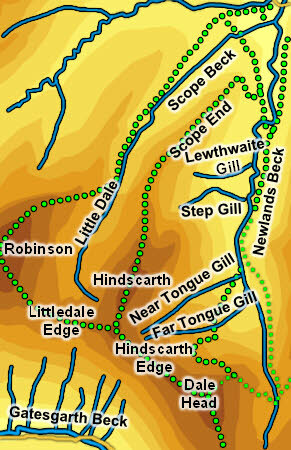 Step Gill and Lewthwaite Gill are both formed on the eastern slopes of Hindscarth's long northern ridge, and both flow east into Newlands Beck. To the western side of Hindscarth is Little Dale, the source of Scope Beck. This flows north, then north-east along the western flank of Hindscarth, before joining Newlands Beck just to the south of Little Town. The bottom end of Scope End was the site of Goldscope Mine, a long lived but rather controversial mine that was originally developed by German miners imported by Elizabeth I and living on Derwent Island off Keswick. There are still visible scars from the mining on the lower slopes of the fell.